The times are not far when robots will take over humans and with Toyota unveiling a robot that plays basketball, people are almost panicking. 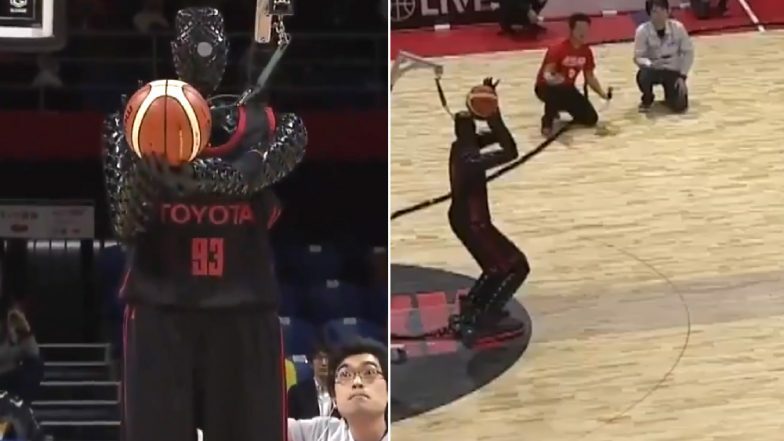 Toyota designed a robot called Cue and in the new range they showed off the robots swift moves on the basketball court. Cue3 donned a Toyota jersey and made perfect throws. So while it may not be that great at mobility, the fact that robots can replace players in future has made people worry. Robot Runs For Mayoral Candidate in Japan! AI Politician Promises Fair and Balanced Politics. Over the years, there are different robots that have been developed to ease human tasks. While they help in some areas, getting them as sports players is something people are definitely not looking forward to. Cue3 uses artificial intelligence to squat, aim, spring upward and release the ball. It is 6 feet and 3 inches tall and it beat two Japanese pro players in a head-to-head competition, thus fans of the sport are screaming a negative for robots. Robot Waiters To Serve People At Restaurant Run By The Disabled in Japan (Watch Video). People were shocked at its skill and think the end is near, if such robots are continued to be made. Check how some people reacted. So while this robot may be good in terms of its functioning, it is a collective sentiment that we cannot take robots to take over us humans.